There’s nothing more embarrassing than having your grandparents tag Grandmaster Flash on Facebook, unless Grandmaster Flash is actually your grandpa (it’s possible—he’s 56), in which case, congratulations. That’s pretty cool. This phenomenon is more ubiquitous than you might think, thanks to Facebook’s “helpful” auto-tag feature—when someone starts typing in a name, it will “suggest” (i.e. automatically fill in) the name of the person Facebook presumes you’re talking about, because it knows everything, including that deep down you secretly want to log on to LDS Singles and find a nice man who will let you live on his planet someday. 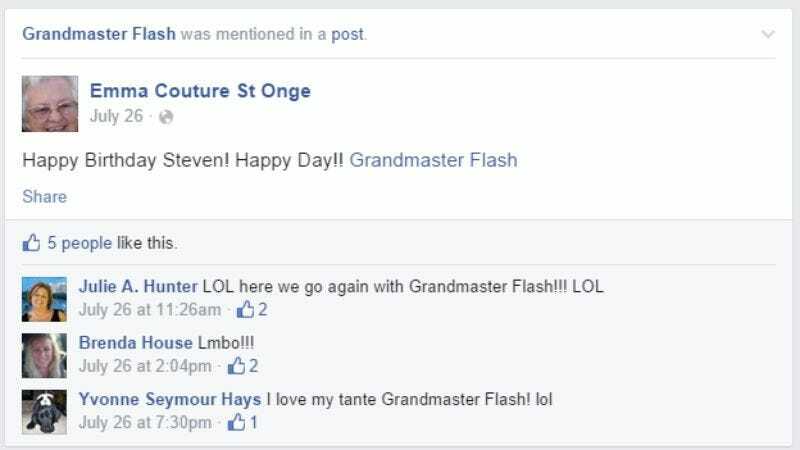 Anyway, Facebook’s first impulse when a user starts typing the word “grand” is to fill in “Grandmaster Flash,” a minor annoyance to the social media literate but an unsurmountable problem to, well, grandmas. (No offense to America’s elders, but they are not known for their technological expertise, leading to condescending AARP commercials like this one.) These gaffes have been collected in a Tumblr called Love, Grampa and Grandmaster Flash, which documents every time a grandmother’s concern for her grandchildren’s health or potty mouth is accidentally posted onto the hip-hop pioneer’s public Facebook wall. Not that Grandmaster Flash probably checks his Facebook that often—he is 56 years old.